The Barnyard Weed Warriors is the only goat rental herd in Kansas, at this time! We only provide in-state weed, brush and invasive tree control but if you live out of the state, we can usually help locate a goat rental herd for you. Goats are the original weed eater and have a very low impact on the land. Goats don’t weigh as much as cattle and their tiny feet aerate the soil. Goats can easily navigate rough terrain that machinery and humans find difficult and they love to climb, to reach those tasty leaves. The goat berry (manure) is a nice pellet, which easily decomposes to provide essential nutrients to the soil, making the goat a great way to fertilize soils. Goats will eat most weeds that grow in Kansas, including Poison Ivy, Poison Oak, Bindweed, Cedar trees, Serecia Lespedeza, young Elm, Oak and Locust trees, Dogwood, Buckbrush, Sumac, Kochia, Dandelions and more. There are some weeds that goats don’t eat and that will often depend on the plant’s life cycle or the toxicity of the plant. 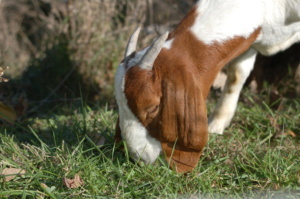 Using goats to control your weeds and brush is the GREENEST thing you can do. The advantages include the fact you don’t have to worry about using chemicals and how they impact the environment, especially if you have an area sensitive to run off during the times of heavy rain. Goats are entertaining to watch and so mesmerizing that many customers opt to have goat watching parties, while the goats are on their property. • Many of the goats have names, some of them are strange, like Airplane or Penguine, these goats were leased out as 4-H animals and returned after their 4-H show season was complete. Some of them did very well and two were named Grand Champion breeding does at the county fairs where they were shown. • Some of our bottle babies are used as therapy goats, before they are weaned off the bottle. We have visited nursing homes and home school groups with the babies, to educate and entertain. • Some of the goats have collars with bells; this is so Mary can locate them, when the brush is dense. • Some goats have been fired from the work crew due to misbehavior, such as not staying with the herd, over aggressiveness towards other goats in the crew or not loading easily. Those fired from the crew only get to work the pastures at home. • Our youngest goats will work on the crew at least two seasons before they have their first babies. This is so they get enough growth, to easily raise babies. • Most of our goats will have their babies between January and May. Which means that some may have babies while we are on the road! • Our goats can graze upwards of 18 hours a day, if there is enough light for them (full moon) to see where they are going.